ARKHANGELSK, September 14. /TASS/. Construction of a new exhibition center was completed in Arkhangelsk. 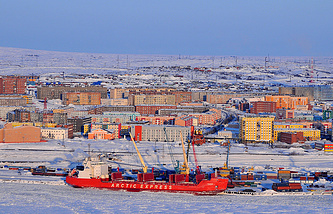 Nord Expo will be the main venue of the Arctic: Territory of Dialogue international forum, due on April 9-10, 2019, the regional administration’s press service said on Friday. "Construction of the Nord Expo congress and exhibition center in Arkhangelsk is completed," the press service said. "The center’s modern opportunities will promote to a new level the events, organized there." The exhibition center of 3,500 square meters (the main hall is 1,600 square meters) is built in a busy area. In the past, Arkhangelsk did not have a big exposition platform like this. In 2017, the annual Arctic Forum was organized at the Northern Arctic Federal University and at the local Drama Theater. The cost of Nord Expo’s construction was 340 million rubles ($5 million). The tax payments to the region’s budget within six years of the exhibition center’s commissioning are forecasted at more than 100 million rubles ($1.5 million). The new center will host the first event from September 20 - it will be the region’s biggest business show, dubbed the Margaritinskaya Fair.